Revel in the beauty of this Apples of Gold art deco style ring. 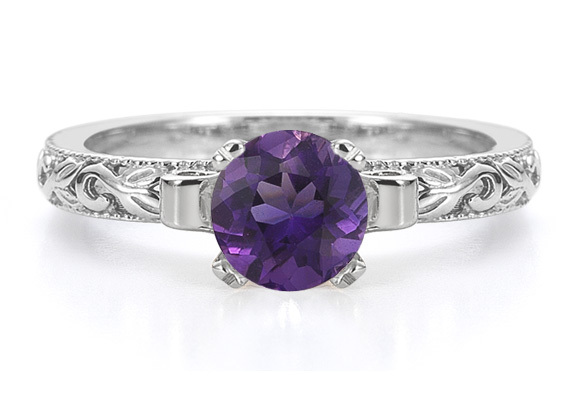 The solitaire gemstone piece is given a purple-hued amethyst for a burst of gorgeous color. The 6mm amethyst is secured in a prong setting and flanked by two beautiful coils of silver. The band is equally stunning with a pattern of vines expertly carved into the ring. A lovely piece of art for any occasion, this solitaire amethyst gemstone ring makes the most of radiant silver and excellent design. We guarantee our Amethyst 1 Carat Art Deco Ring in Sterling Silver to be high quality, authentic jewelry, as described above.